This Might Sound Stupid, but… How Did Doughnuts Become a Breakfast Food? The French have croissants. The Spanish have churros. And here in America, the doughnut is our dessert-for-breakfast food of choice. The sweet, ring-shaped fried cake has become the expected accompaniment to any office breakfast meeting. 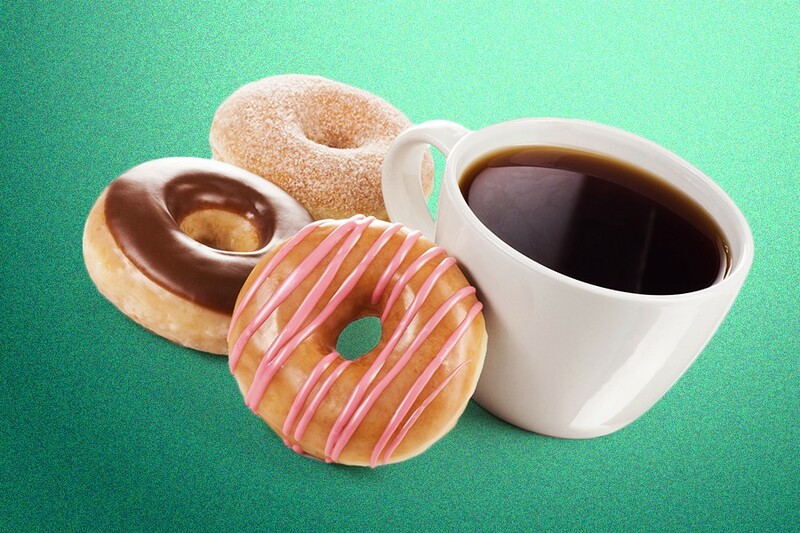 But considering your standard doughnut is packed with more than 300 calories, 11 grams of sugar and 6 grams of saturated fat, how in God’s name did it become legitimized as a morning meal? Let’s start with the origin story of the doughnut, which begins in the mid-19th century. According to A Definitive History of Doughnuts, by Mr. Breakfast (the alter ego of Eddy Chavey, author and graduate of the Los Angeles New School of Cooking), back then, doughnuts were known as olykoeks (oily cakes). It’s believed that the Dutch were responsible for first taking sweet dough balls and frying them in pork fat, and it was pilgrims from Holland who brought olykoeks to America. During World War I, the doughnut had already achieved its status as an American favorite, and American soldiers were sometimes served them by grateful French locals as a reminder of the food back home. Still, although popular, their association was more with movie theaters (where they were a popular snack) than the breakfast table. This changed in the 1940s and 1950s, when chains like Krispy Kreme Doughnuts and Dunkin’ Donuts started gaining momentum, buoyed by the invention of the first “doughnut machine” a decade or so earlier (by 1934, the machine’s inventor, a Russian expat named Adolph Levitt, was pulling down $25 million annually for the sale of his doughnut machines to bakeries). What was it about these chains, though, that caused people to associate doughnuts with breakfast? In short: Coffee. With the advent of the doughnut machine, doughnuts became more common in bakeries across the country. And since most bakeries were already serving a good ol’ cup of joe for people to buy with their morning bread, by sheer association, the doughnut, too, became a plausible breakfast item. As for why coffee originally became a morning staple, that’s down to the “alcohol-soaked” Europe of the 17th and 18th centuries, when boozing at breakfast was fairly standard — tea and coffee, with their perky side effects, became an acceptable replacement as society attempted to steer itself in a straighter line. But of course, in what would soon become the U.S., tea was considered a “traitor’s drink” by the late 1700s, making coffee the sole revolutionaries’ drink of choice. Much has changed since then, of course, and a cup of coffee isn’t as simple as it once was. Eating a single Krispy Kreme doughnut with a Starbucks mocha Frappuccino, in fact, will cram more than double your daily allowance of sugar into your body before you’ve even had lunch. Something to think about next time you’re considering what is essentially cake and a milkshake for breakfast.